Today’s era of intense globalization has unleashed dynamic movements of people, pathogens, and pests that overwhelm the static territorial jurisdictions on which the governance provided by sovereign states and their formal intergovernmental institutions is based. This world of movement calls for new ideas and institutions to govern people’s health, above all in Africa, where the movements and health challenges are the most acute. This book insightfully explores these challenges in ways that put the perspectives of Africans themselves at centre stage. It begins with the long central and still compelling African health challenge of combating the pandemic of HIV/AIDS. It then examines the global governance responses by the major multilateral organizations of the World Bank and the World Trade Organization and the newer informal flexible democratically oriented ones of the Group of Eight. 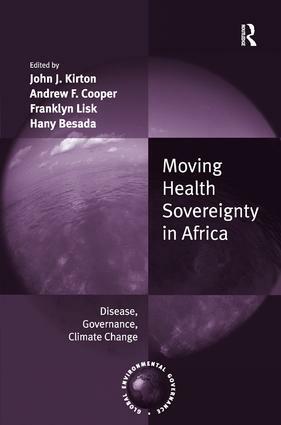 It also addresses the compounding health challenge created by climate change to assess both its intensifying impact on Africa and how all international institutions have largely failed to link climate and health in their governance response. It concludes with several recommendations about the innovative ideas and institutions that offer a way to closing the great global governance gaps and thus improving Africans’ health and that of citizens beyond. John J. Kirton is the co-director of the Global Health Diplomacy Program, based at the Munk School of Global Affairs at Trinity College in the University of Toronto, and a professor of political science at the University of Toronto. He is also the director of the G8 Research Group and co-director of the G20 Research Group. Andrew F. Cooper is a professor at the Balsillie School of International Affairs and the department of political science at the University of Waterloo. He is also an associate research fellow at the UNU CRIS, the United Nations University’s Institute on Comparative Regional Integration, in Bruges, Belgium. Franklyn Lisk is a visiting professorial research fellow at the Centre for the Study of Globalisation and Regionalisation at the University of Warwick and a senior associate at the Center for Research on Political Economy in Dakar, Senegal. Hany Besada is a senior fellow at the Centre on Governance at the University of Ottawa, an adjunct research professor with the Institute of African Studies at Carleton University, and a PhD candidate at the University of Warwick. He served as a research specialist for the secretariat of the United Nations High-Level Panel on the Post-2015 Development Agenda. Global Environmental Governance addresses the new generation of twenty-first century environmental problems and the challenges they pose for management and governance at the local, national, and global levels. Centered on the relationships among environmental change, economic forces, and political governance, the series explores the role of international institutions and instruments, national and sub-federal governments, private sector firms, scientists, and civil society, and provides a comprehensive body of progressive analyses on one of the world's most contentious international issues.